For the last audition episode of "American Idol" on Thursday, the judges panel was treated to a skirted surprise. As Mariah Carey, Randy Jackson, Keith Urban and Nicki Minaj weeded through the contestants in Oklahoma, in walked one "Pepper LaBeija," there to spice things up a bit. 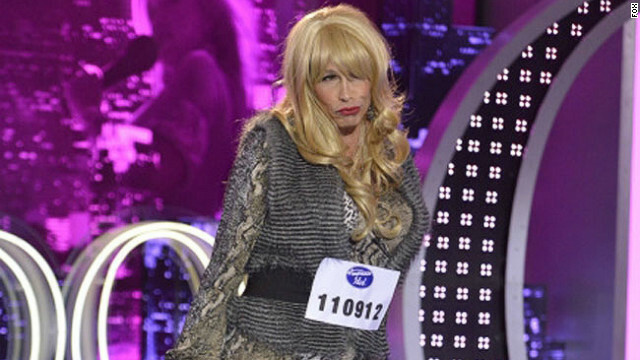 In actuality, of course, it was former "Idol" judge Steven Tyler. He was committed to his appearance as Pepper, arriving in a wig, lipstick, heels and with a full bosom. Urban was the sole member of the panel to immediately fall into a fit of laughter, while Jackson channeled his inner Liz Lemon and exclaimed, "what the what?!" Carey and Minaj, meanwhile, bore polite, if not a little confused, smiles. After Tyler told a few jokes in a noticeably strained voice, Minaj called him out. "Dude look like a lady," Carey quipped. Sadly, though the Aerosmith frontman said he tried hard, he didn't make it through to Hollywood week. Nice that he paid homage though to one of the most beloved stars of the 1990 documentary "Paris is Burning." What'd you think of the last audition episode, and of Tyler's "audition"? Sound off below! i know the 1 he voted for...she's not young. is that Liv in the year 2040? You can't fool me...that is really Taylor Swift dressed up to look like Steven Tyler. Minaj is terrible to watch. Her fake accents and ridiculous outfits bring nothing to the show. Thank goodness for Steven Tyler! I predict (and I hate to do this but..) that the Tyler-in-Drag moment will be the ONLY watchable moment all season. that was the payback..... "the theater"
because i ONLY CRIED FOR 6 FKING MONTHS–otherwise all clear..
i'm just so dumb and illiterate today. becauaw i ONLY CRIED FOR 6 FKING MONTHS–otherwise all clear..
the point knows nothing–love he arts don't you....xo. Cookies? Put that cookie down, NOW! Still wearing his daughters clothes, eh? that's what we depend on folks. Typical crazy Steven Tyler. I wish he was still on Idol. He is great. Jimmer likes to crossdress and sell his body to black men. i love when david sings. I recognized him as soon as he came out. He makes a very ugly woman! I was like Keith – LMAO! He makes a very ugly man too! steven tyler appreciates it...SAME ROUTINE. I think AI is more enjoyable this year. With each episode the judges get better. Our family likes it. Sorry, Richard Fore, we ain't going for that one! Still a looser, huh? Meant that for the sly sadie one. My bad! You were right. It is both of them. Still a looser, Dicky Foreskin. could the blooger mean oops? Did he pooop his pants? He's really old so there's a good chance he did. someone will bring pie. I likes me some pie. best. Is the interception recuperating ? He's in drag? Dude dresses like that ALL THE TIME. Best part of the entire show. Probably the season!! The funny part of all this is that if he wasn't already famous and was just trying out now as a contestant, I can practially guarantee that he wouldn't make the cut. Man, that dude looks like one ugly lady! Nice to see some people still have 1.